Today let talk about my non-negotiable about the van conversion. I wanted a high bed for bikes to be stored under it with a good quality mattress. I am not a good sleeper and before we even ventured on this endeavour. My husband had to agree that the bed would be super comfortable and easy for me to get in to. MMM well, one is right. First things first the mattress. The very essence of the bed. I know that a lot of people scrimp on the mattress and use foam but that is just not how I roll. This is anti-allergy and anti dustmite. I have asthma so this is a must for a mattress for me. We choose memory foam as it keeps you cool in the summer and warm in the winter. which is perfect for a van conversion. It has a zip off cover which is also ideal for a van conversion as you want to be able to wash it. OH MY GOODNESS this mattress is the nicest I have ever slept on. My husband is never one to really notice matresses he is blessed with being able to sleep anywhere but he said this is the comfiest thing he has ever slept on. It really is divine and The service from Happybed.co.uk was super fast and even delivers to the highlands! 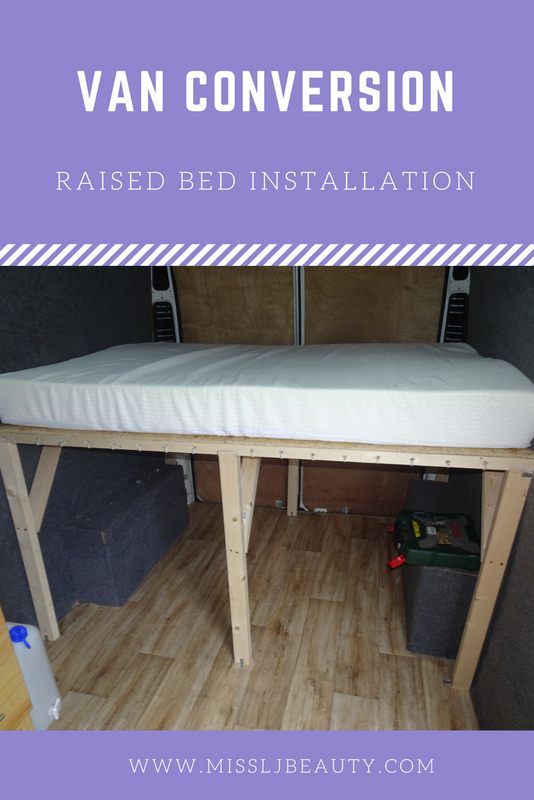 The bed is made of wood supported frame and plywood top. all done with screws and joins. this was super easy to pop together and install. we had to do the measurement right to make sure all our bikes fit under. from mountain bikes to downhill bikes. Also, there needs to be enough headroom so that sitting up on the bed was easy and didn't feel coffin-like. 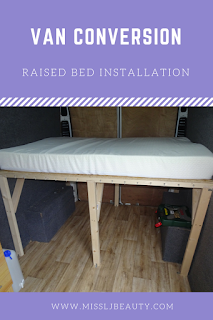 Luckily the bed fitted in across the van as if it didn't we would have lost loads of space the benefit of a Fiat Decato over any other vans. I will explain this little addition in another post in detail but this is our bike storage solution. the bed is a bit too high for me to get up to, I had to buy one of those little kid steps so I can reach the bed.